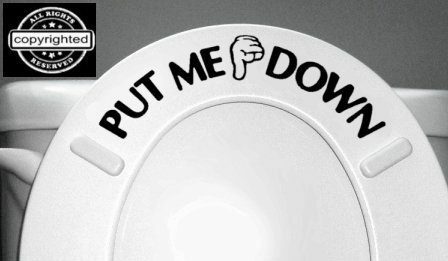 PUT ME DOWN Bathroom Toilet Seat Vinyl Decal Just $1.69 + FREE Shipping! You are here: Home / Great Deals / Amazon Deals / PUT ME DOWN Bathroom Toilet Seat Vinyl Decal Just $1.69 + FREE Shipping! This makes me laugh! If the guys in your house need a little reminder, get the PUT ME DOWN Decal Bathroom Toilet Seat Vinyl Decal. It’s just $1.69 and will ship for FREE on Amazon! Die Cut – Not a cheap paper Sticker // Decal will come as 3 parts – the backing paper, the sticker itself, and the clear transfer tape.